Ever wonder why we celebrate Imbolc the way we do? From the ancient Roman festival of Februalia to the legend of St. Valentine, this time of year is rich in custom and tradition. Learn about some of the folklore and history behind today's Imbolc celebrations. Although traditionally Imbolc is associated with Brighid, the Irish goddess of hearth and home, there are a number of other deities who are represented at this time of year. Thanks to Valentine's Day, many gods and goddesses of love and fertility are honored at this time. From the Italian Aradia and Celtic Aenghus Og to Venus and Vesta of Rome, this season is connected to a number of gods and goddesses. Scotland's Shetland Islands have a rich Viking heritage, and in fact were a part of Norway for some five centuries. As such, the people who live there have a culture that is a unique blend of Scandinavian and Scottish. The town of Lerwick seems to be the home of Up Helly Aa, which is a relatively modern celebration that traces its roots back to the Shetlands' Pagan origins. During the Regency period and the years following the Napoleonic Wars, Lerwick was the home of many returning soldiers and sailors, most of whom were looking for a good party. It became a rowdy place, particularly during the week after Christmas, and by the 1840s, celebrations usually involved setting lots of things on fire. At some point, burning tar barrels were introduced into the fun, and this led to plenty of injury and destruction. By the 1870s, a group of young people decided that the post-Christmas shindig would be a lot more entertaining if it were organized, and so the first Up-Helly-Aa celebration was begun. They pushed it back to the end of January and introduced a torchlight procession. A decade or so later the Viking theme emerged into Up-Helly-Aa, and the festival started to include a flaming longship each year. Although the event seems to have taken a short break during the World War II years, it resumed in 1949 and has run ever since. In addition to the Viking longship, there is a lot of planning involved in the celebration, which is held on the last Tuesday of January (the next day is a public holiday, to allow for recovery time). One of the biggest parts of the festival is the costume of the Guizer Jarl, the Chief Guizer, who appears each year as a character from the Norse sagas. Thousands of spectators come to watch the festivities, and hundreds of male residents dress in Viking gear and storm through the streets. 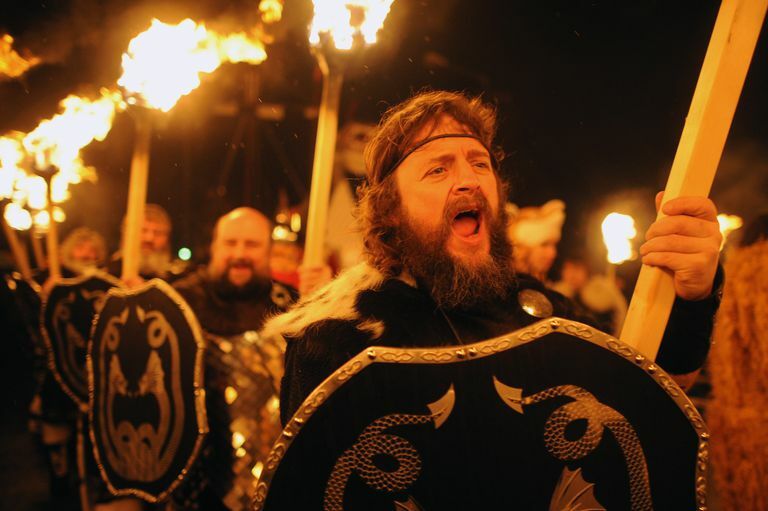 Although Up-Helly-Aa is a modern invention, it's clear that the residents of Lerwick and the rest of the Shetland Islands embrace it as a tribute to their Norse ancestry. It's got fire, food, and lots of drinking–the perfect way for any Viking to celebrate the season! Brighid was a Celtic hearth goddess who is still celebrated today in many parts of Europe and the British Isles. She is honored primarily at Imbolc in a number of modern Pagan traditions, and is a goddess who represents the homefires and domesticity of family life. Be sure to read all about this powerful triune goddess. February is a great time of year to be in the greeting-card or chocolate-heart industry. This month has long been associated with love and romance, going back to the days of early Rome. Groundhog Day is observed every year in North America on February 2–the same day that Imbolc, or Candlemas, happens to fall. Despite the seemingly modern aspects of this tradition, in which a plump, confused-looking rodent is hoisted up in front of a throng of newscasters at the crack of dawn, there's actually a long and interesting history behind the occasion. The Greeks believed that an animal's soul was contained in its shadow. Hibernation was a time of spiritual renewal and purification, and an animal that saw its shadow in the spring needed to go back to bed for a while until its misdeeds were expunged. winter shall not come again. In the Carmina Gadelica, folklorist Alexander Carmichael points out that there's actually a poem in honor of an animal emerging from its burrow to predict spring-like weather on "the brown day of Bride." However, it's not the cute, cuddly groundhog we're used to seeing in the United States. In fact, it's the decidedly uncuddly serpent. Scotland's Highlanders had a tradition of pounding the ground with a stick until the serpent emerged. The snake's behavior gave them a good idea of how much frost was left in the season. In Europe, rural dwellers had a similar tradition. They used an animal called a dachs, which is a bit like the badger. When settlers came to Pennsylvania in the eighteenth century, they renewed the custom with a more local animal–the groundhog. Each year, Punxsutawney Phil is removed from his den by his keepers, at which point he whispers the forecast to a top-hatted member of the official Groundhog Club. January 24 is the festival of Sementivae, which is a planting festival that honors Ceres and Tellus. Ceres, of course, is the Roman grain goddess, and Tellus is the earth itself. This festival was held in two parts–the first part was held from January 24 to January 26, honoring Tellus, and was a season of sowing the fields. The second part, which began a week later on February 2, honored Ceres as the goddess of agriculture. Ceres is the Roman variant of Demeter, who is strongly tied with the changing of the seasons. Februus, for whom the month of February is named, was a god associated with both death and purification. In some writings, Februus is considered the same god as Faun, because their holidays were celebrated so closely together. The festival known as Februalia was held near the end of the Roman calendar year, and was a month-long period of sacrifice and atonement, involving offerings to the gods, prayer, and sacrifices. The Parentalia festival was celebrated each year for a week, beginning on February 13. Originating in Etruscan practice, the celebration included private rituals held in the home to honor the ancestors, followed by a public festival. The Parentalia was, unlike many other Roman celebrations, often a time of quiet, personal reflection rather than boisterous merrymaking. February was considered the final month of the Roman year, and on the 15th, citizens celebrated the festival of Lupercalia. Originally, this week-long party honored the god Faunus, who watched over shepherds in the hills. The festival also marked the coming of spring. Later on, it became a holiday honoring Romulus and Remus, the twins who founded Rome after being raised by a she-wolf in a cave. Eventually, Lupercalia became a multi-purpose event: it celebrated the fertility of not only the livestock but people as well. To kick off the festivities, an order of priests gathered before the Lupercale on the Palatine hill, the sacred cave in which Romulus and Remus were nursed by their wolf-mother. The priests then sacrificed a dog for purification, and a pair of young male goats for fertility. The hides of the goats were cut into strips, dipped in blood, and taken around the streets of Rome. These bits of hide were touched to both fields and women as a way of encouraging fertility in the coming year. Girls and young women would line up on their route to receive lashes from these whips. There is a theory that this tradition may have survived in the form of certain ritual Easter Monday whippings. After the priests concluded the fertility rites, young women placed their names in a jar. Men drew names in order to choose a partner for the rest of the celebrations–not unlike later customs of entering names in a Valentine lottery. To the Romans, Lupercalia was a monumental event each year. When Mark Antony was the master of the Luperci College of Priests, he chose the festival of Lupercalia in 44 BC as the time to offer the crown to Julius Caesar. By about the fifth century, however, Rome was beginning to move towards Christianity, and Pagan rites were frowned upon. Lupercalia was seen as something only the lower classes did, and eventually the festival ceased to be celebrated.